situated on Aldinga rd halfway between Willunga & Aldinga . For the budget minded holidaymaker. Great views of the farm & ADELAIDE HILLS. Tony and Shelia are your hosts for a great holiday, complete privacy. You can see up close alpacas for a worthwhile experience on the farm. Only a few minutes drive to the beach & shops. Be aware supermarkets close 7pm. McLaren Vale wineries nearby & 5 pubs only 10 minutes drive from the retreat. Can sleep four people. 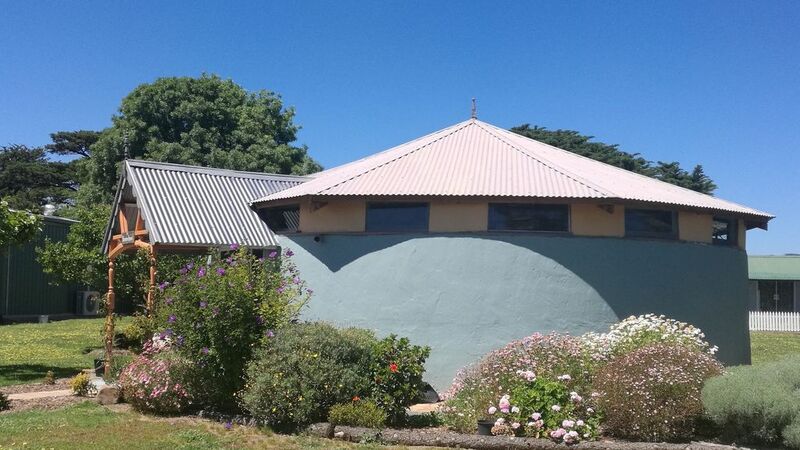 THE ROUND COTTAGE provides guests with dedicated hospitality, complete tranquility, stunning rural vistas, and yet easy access to over 60 cellar doors, award winning restaurants and some of South Australia’s finest beaches. Our host Sheila and Tony were wonderful. The experience staying in the Roundhouse was something unique. When we told other people we needed to show them the photos for them to understand what we meant. They were surprised and thought how wonderful the idea of converting a rainwater tank into a bed and breakfast. It is wonderful accommodation for your pets as a dog Milly enjoyed the stay. Ye Olde Farm Lodge "Tony's Music Cottage"
On our arrival we were invited to stay in "Tony's Music Cottage" rather than The Round House as originally booked. 'Tony's Music Cottage' offered larger and very comfortable accommodation and suited us very well for our 4 night stay. The location in Whites Valley proved most convenient for our family visit. We would certainly consider this property on a future visit to SA. The hosts, Sheila and Tony were very kind and most helpful. Many thanks. The converted rainwater tank accomodation was a unique experience. It is very well hosted and supplied with all the necessities to have a great stay. Totally enjoyed by all. Small well behaved house trained dogs allowed which is THE most important thing for us when looking for holiday destinations. Rear small courtyard was used regularly. Plenty of daylight inside, great shower, firm comfy bed, clean and tidy. Good aircon and fan. Large TV and foxtel. Ample breakfast supplies. Friendly atmosphere. 4 & 1/2 stars.